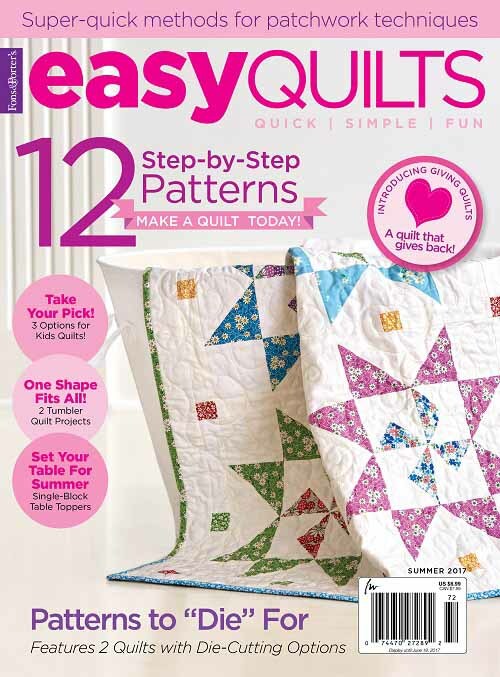 I am so excited I can now reveal my Sausalito New York Beauty Quilt pattern in full! What do you think? 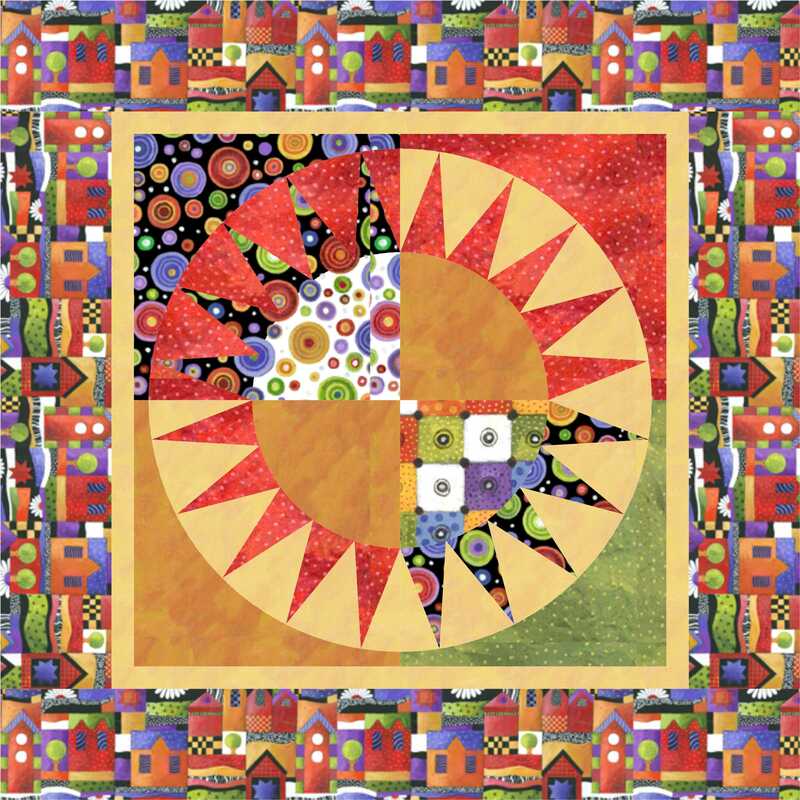 The quilt design uses fabrics, designed by Christine Graf, from Quilting Treasures’ Sausalito group. The prints are loud, bold, eye-catching, and cheerful, while the blenders are just as attention-grabbing! 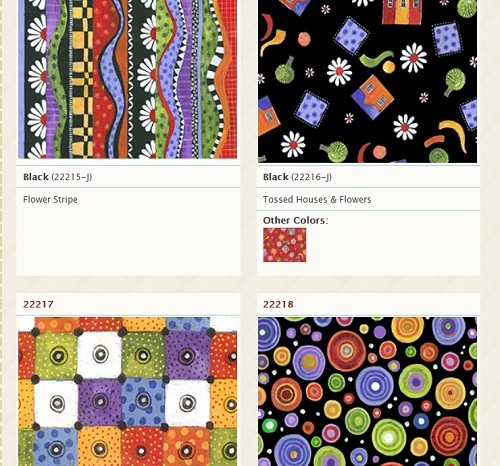 These fabrics are shipping to shops in July. Keep your eyes peels for them to show up at your local quilt stores. You may download the pattern instructions here. Included in the instructions are also steps to make a bonus throw pillow from leftover fabrics. 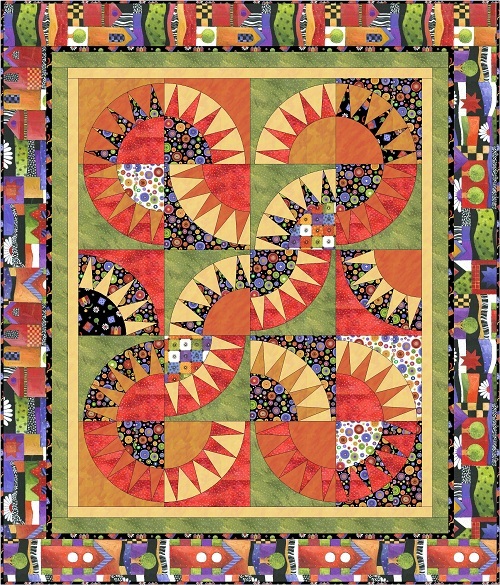 Hancocks of Paducah is selling the kit for this quilt. 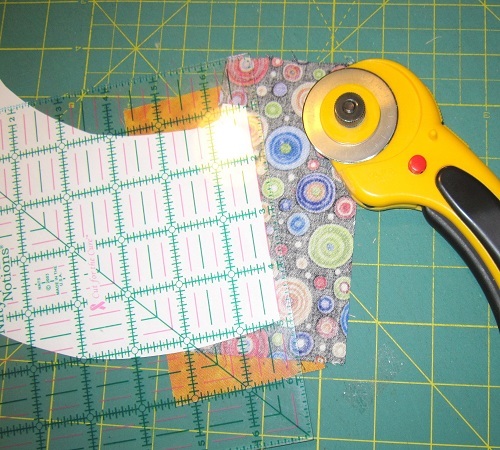 If you are skilled in paper-piecing, the remainder of this post might be a bore to you. So, please feel free to skip. I am not going describe the paper-piecing method in a detailed manner. There are plenty of tutorials online that are excellent if you are interested to find out more. Angie Padilla’s tutorial is very concise and straight to the point. I am going to share with you just what I did for paper piecing the “spike” part of the NY Beauty Block Spikes. 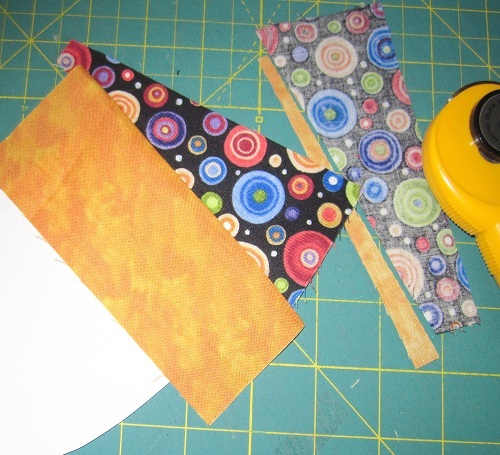 So, these are what I started with – paper foundation template, and pieces of fabrics I cut for the patches. I am VERY generous when it comes to cutting the fabric pieces for the patches. I normally cut at least 1″ extra on all sides. You will notice that the wrong side of the A1 black bauble fabric is facing the wrong side of the paper template. Then, I inserted a pin on the seam between A1 and A2 that I would be sewing. Note the EXTRA fabric around the patch A1. Then, I turned the ensemble OVER. You see that pin? 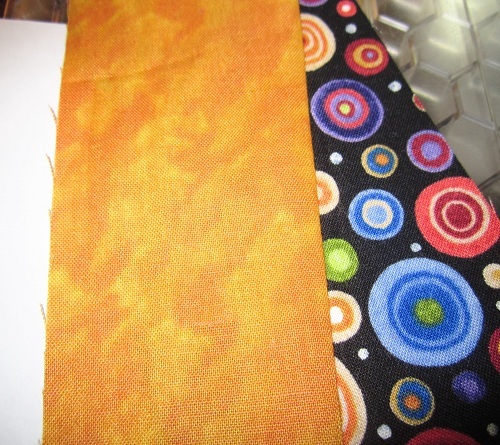 Then I took the fabric that would be patch A2 and turned it UNDER at least about 3/8″. 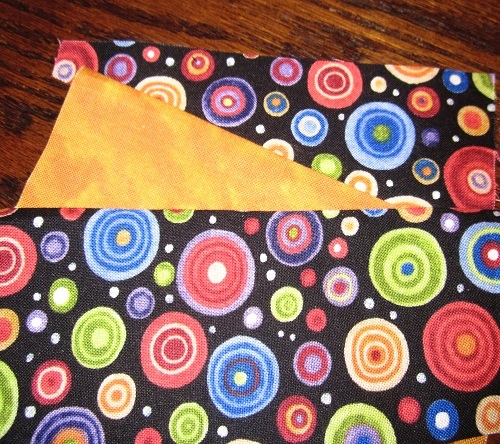 The A2 fabric piece would be RIGHT side UP. I checked to see if the rest of the A2 gold fabric piece would cover A2 on the foundation template sufficiently by holding the ensemble against a light source. The pin was there to show me where to align my “folded” seam allowance. 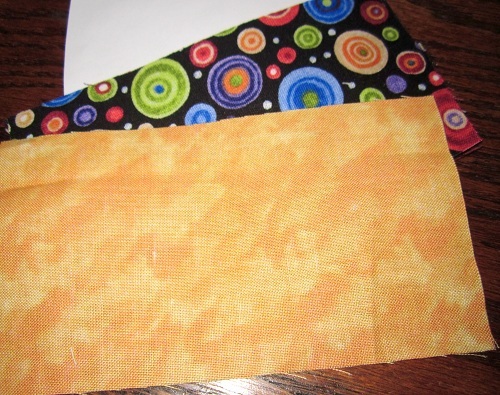 The seam allowance needs to be PARALLEL and TOUCHING the pin. I hope this is making sense? Then, I placed the of the A2 fabric gold piece (that is NOT the seam allowance) on top of the A1 black bauble piece. That gold fabric piece in the following image is actually shown WRONG side UP – in case it is not readily seen from the picture. That black bauble piece was never moved from being pinned to the paper foundation template earlier. Without dis-locating the gold piece (since it is not pinned), I gingerly turned the ensemble OVER. 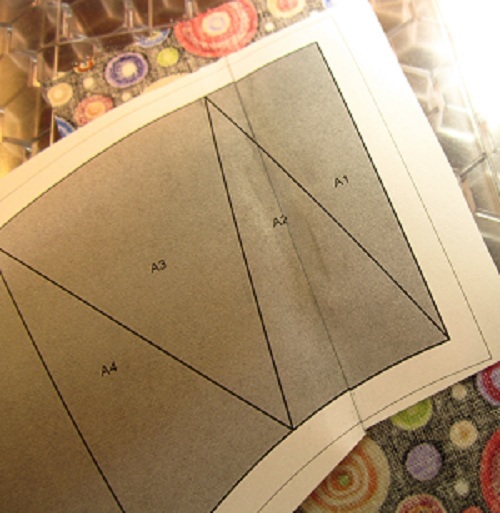 Note: Paper Piecing Template: RIGHT SIDE UP, Black Bauble Fabric (A1): WRONG SIDE UP, Gold Fabric (A2): RIGHT SIDE UP. I was ready to sew the seam between A1 and A2. I turned over the ensemble over to reveal the seam allowance. Black Bauble (A1) Fabric: RIGHT SIDE UP, Gold (A2) Fabric: WRONG SIDE UP until the next step. I turned over the gold fabric to its RIGHT side and finger pressed. 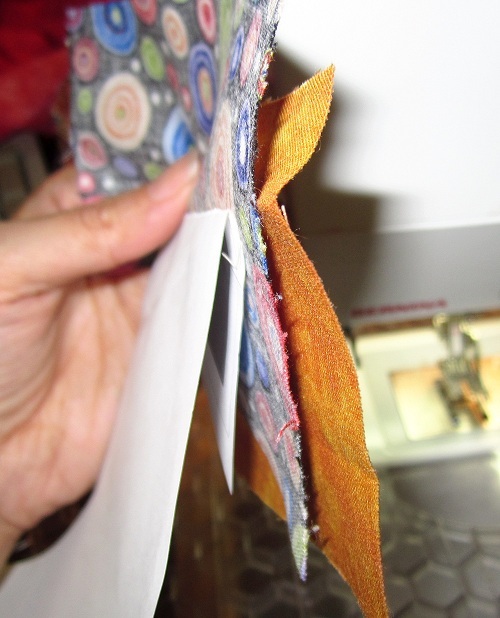 Now, we are at the point of trimming the seam allowance to 1/4″. Okay, do you see how I separated the seam allowance from the rest of the ensemble? 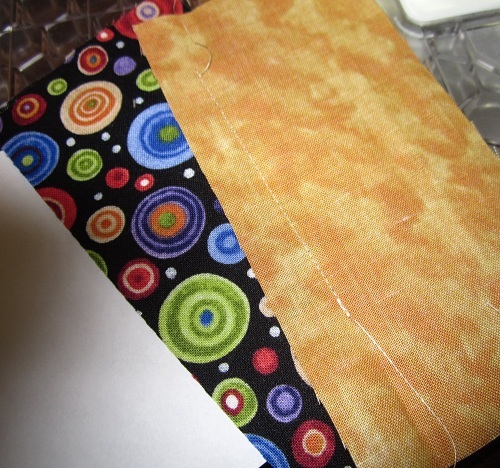 The seam allowance pieces are toward the top. 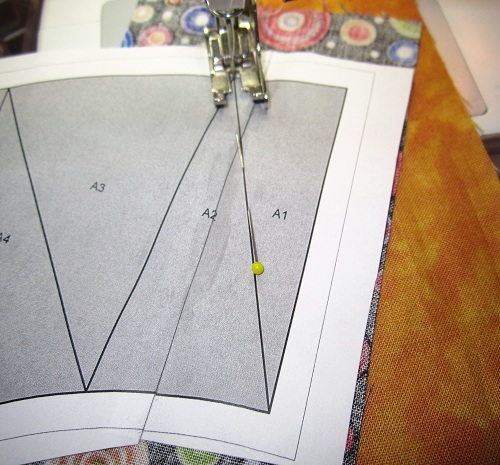 I then placed the ensemble on my cutting table, and trim the seam allowance to measure 1/4″. I flipped the A2 gold fabric piece to its right side. Now A1 and A2 become “one” unit to which I would add A3 (refer to the picture that shows the foundation template in its entirety) going through the whole process again. Sorry for the LONG post today, but I wanted to include the part on paper-piecing the NY Beauty Spikes in case some of you might be hesitant to try making the NY Beauty Blocks. They are easier than they look. Trust me! :) Thanks for stopping by. Have a lovely day! 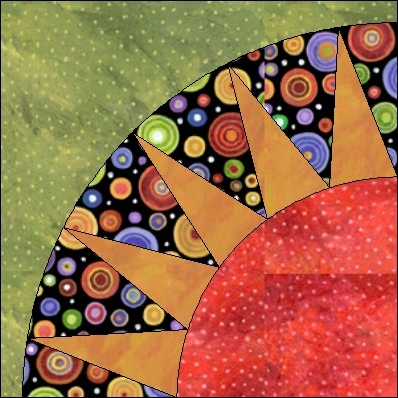 This entry was posted in Freebies, Ideas, Quilt Pattern, Quilting, Tutorials and tagged Christine Graf, New York Beauty Quilt, Quilting Treasures Sausalito, Wendy Sheppard. Bookmark the permalink. absolutely stunning. WOW!!!!!!!!!!!!!!!!!!!!!!!!! love, love the fabric as well!!!! Oooooo…I really like this one! It is fun, festive, and looks like a celebration! Lovely! So gorgeous and beautiful! Love it! 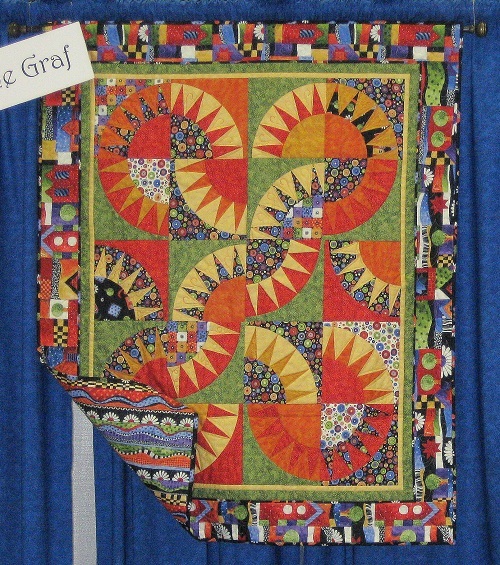 Thank you very much for this quilt pattern by Christine Graf. I love it! 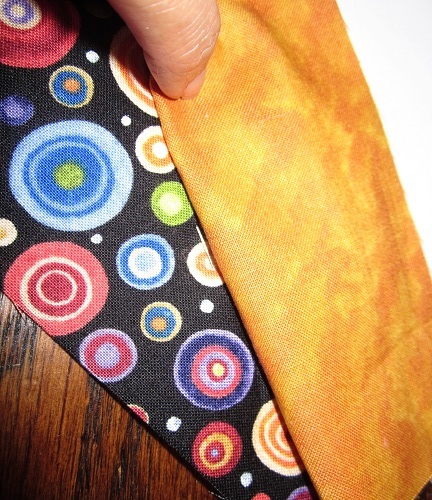 Can’t wait to order some of this fabric. 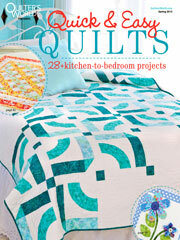 It would be just the quilt to work on during a gray cold winter in anticipation of spring and summer. You, as always, have done a tremendous job. If your travels ever bring you through Indiana, let me know. I would love to meet you and Miss Baby for lunch that could last an entire afternoon. 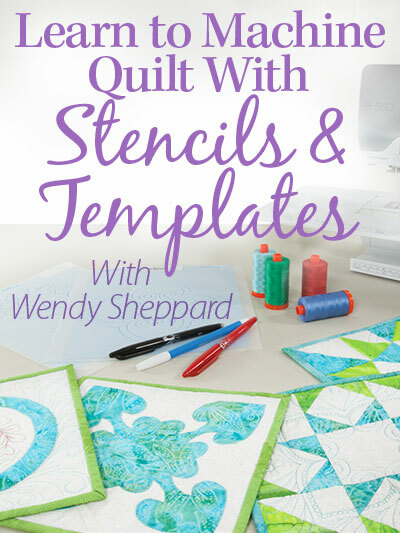 I would just love to listen to you talk about quilting and listen to every tidbit! Enjoy your summer! Thanks! This is beautiful! I have put it on my bucket list! 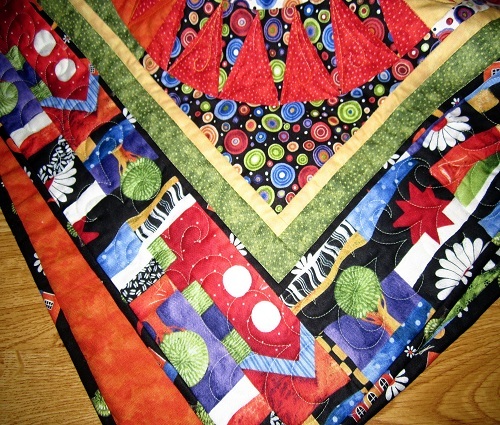 Wendy – I’m curious about how you quilted your Sausalito New York Beauty. I can see some swirls and quilting in the borders, but what did you do around the spikes? I’m working on a Spinning Star quilt and am still trying to decide how to quilt it. Love the fabrics in this one!! Fabulous work, as usual! I so love this pattern. I have it all printed off. As you know i looooove PP (remember the rose quilt i did). My challenge will be picking out colours. Theses are beautiful. I have been on other sites too. Looking to see what people have chosen. It will be the Jan snow storm quilt! Oh, I love this quilt. Thanks so much for the links and the wonderful instructions. 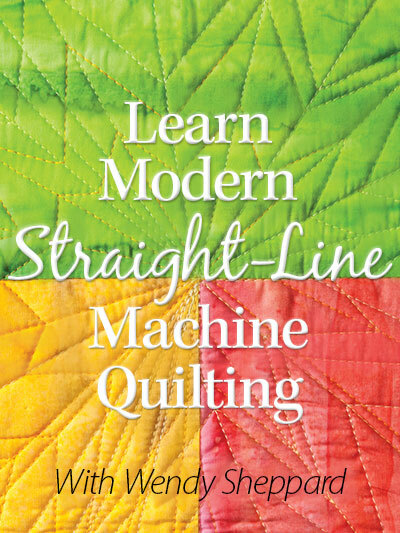 I am so excited; I’m taking my first-ever machine quilting class this afternoon and I just found out that I’m the only one who signed up, but the sweet wonderful teacher is going to still hold the class just for me. 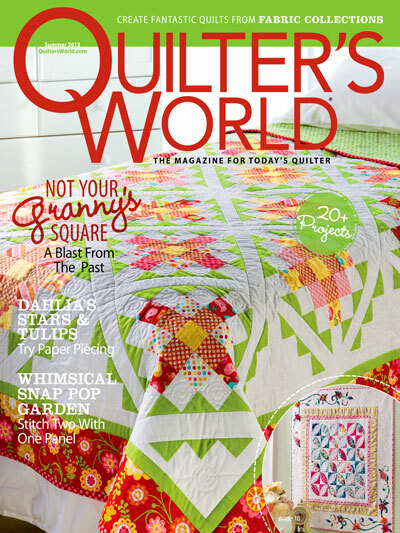 Aren’t quilters just the nicest people ever? I finished all the “in the hoop” embroidered quilting designs on my drunkard’s path quilt, so the class is coming just in time for me to FMQ the rest of it and get it finished off — so I can start a new project! Thanks as always for your inspiration and encouragement. Love this one, Wendy. 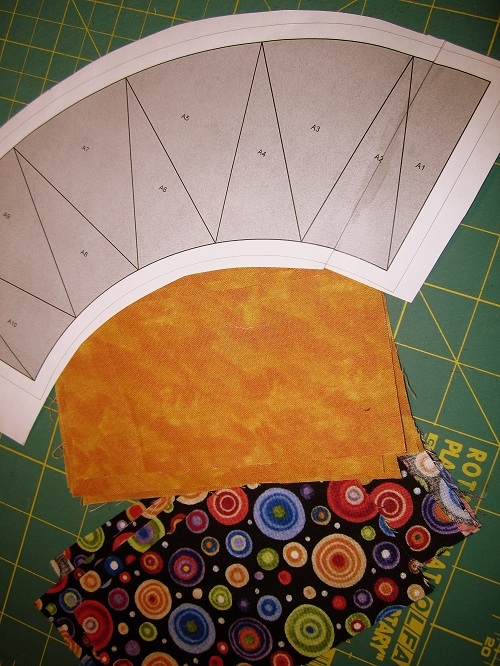 NYB is a favorite… thanks for sharing the pattern. 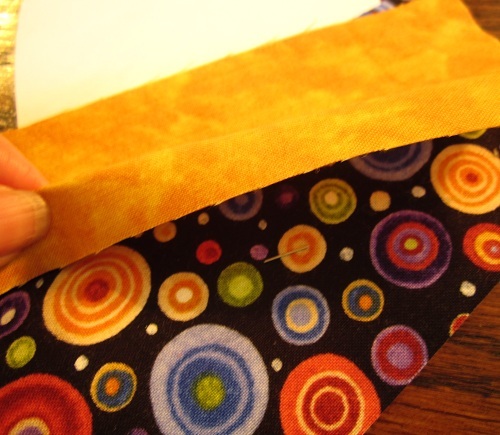 You should get a CM Designs Add-A-Quarter 6″ yellow ruler to trim those seams. Less than $10 and easier to handle for this type trimming than your large ruler… just a thought. Thanks for the link to the free pattern. I’ve always love New York Beauties but have never made one. Great tutorial!!! Absolutely stunning. Thank you very much. Thanks so much for the pattern. It is fantastic, and I have always wanted to try this. My quilting friend and I went to a paper piecing class last week with the sole purpose of working up to a Beauty! This quilt certainly is beautiful. We did not use pins in our class. We held the initial start down with some fabric glue, and then used some template plastic to fold the paper over with, and line up the exact cut with the add quarter ruler. It seemed to make the whole process go quite smoothly. Thanks again for all the inspiration and great links. Wendy worth the wait! Look forward to your e-mails, I’ve learned so much from you. 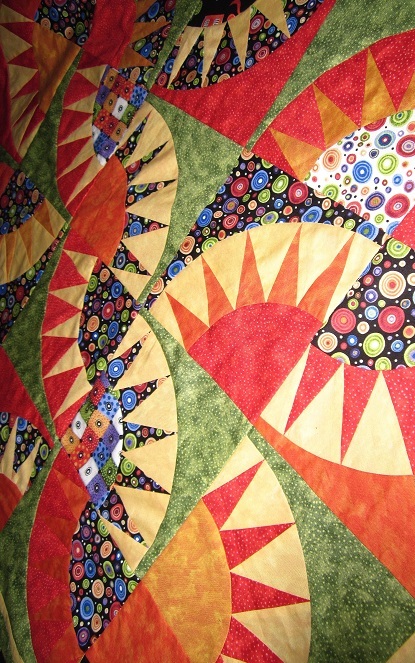 That is just gorgeous and you did such a nice tutorial on the spike piecing. 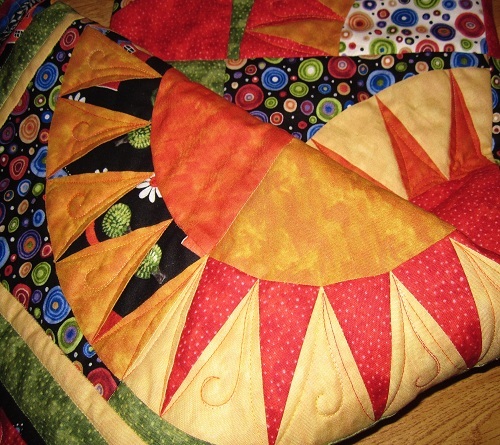 What a beautiful quilt and thanks for sharing the pattern! I am trying to learn paper piecing……but not doing very well so far. Gorgeous, Stunning, Fantastic, WOW!!! Love this!! Well done, Great work!! Thank you for sharing. I can’t find the pattern. this quilt is so festive. It makes you feel so happy. but where is the pattern? This ‘beauty’ of a quilt really has me going. My niece becomes a teen next month and I’m making her this big girl quilt. She is most beautiful and even more beautiful in her heart and mind. WOW oh WOW!! I know I’m really late with thi but it’s just absolutely stunning. LOVE IT!!! Thank you so much for sharing this because I am so going to try this with fabric I don’t like anymore first and then with the fabric I love. This is just gorgeous. I love it. Unfortunately I’m a beginner Patti and probably shouldn’t attempt such a beautiful thing as it is but I sure enjoy looking at it. 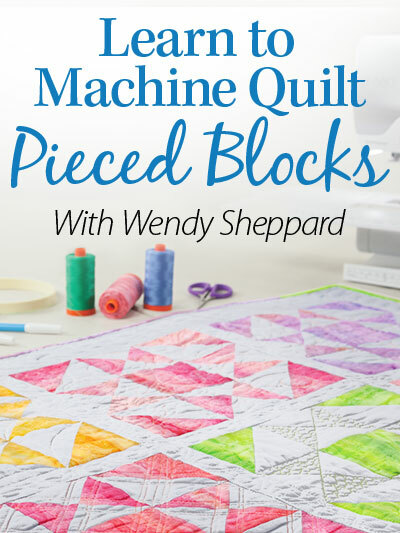 My daughter is the quilter and I will give her the pattern. It’s so beautiful! Oh I love this and I think I’ve just found the fabrics for it! Colour Purple and green and orange. I’m really excited about this pattern. 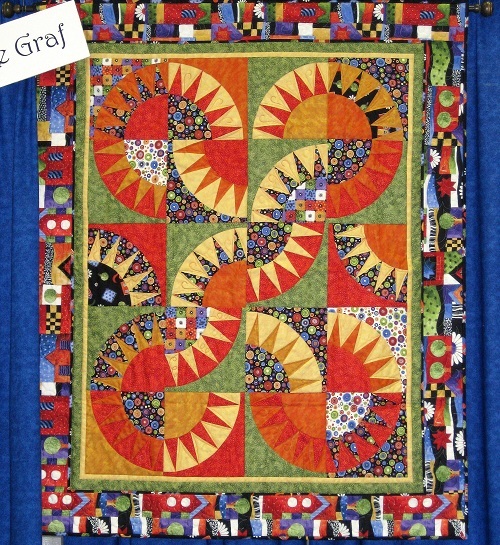 What even more bad is that I shouldn’t even be looking or thinking about another quilt!!!!!!! OM gosh!!!!! Now where to find the pattern. All these lovely instructions will be very helpful thank you ivoryspring/wordpress. Just as well I love paper piecing too!!!! Thanks heaps Julie. Hello, awesome webpage you’ve presently. It is so bold and so fun, but I am not quite ready for that detailed piecing yet. It is absolutely gorgeous though. Your Sausalito quilt is beautiful and I was so excited to download the pattern. Unfortunately, when making up the first block, regardless of how I tried to ease in the center points portion into the two side pieces (B1 & C1) it would not ease in properly and was pulled out of shape and was if the two side pieces were too small for the remainder of the pattern even though I added the piece to C1. I even clipped the curves (although that is not recommended) with no success. 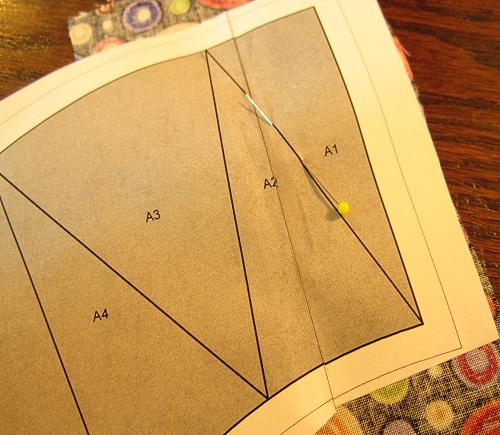 I am relatively new to paper piecing, however, have taken a couple of classes and have sewn for a number of years.. Is there a possibility that the pattern pieces are off. Again, thank you for being so gracious to share your patterns and beautiful quilts. Funny I’ve received this same email about 10 times, hope your account didn’t get highjacked.